I’ll talk about the game first and what it means afterwards, because the situation is pretty dire and it would be easy to get ahead of myself in exploring the truly pathetic and unfortunate predicament in which we currently find ourselves. 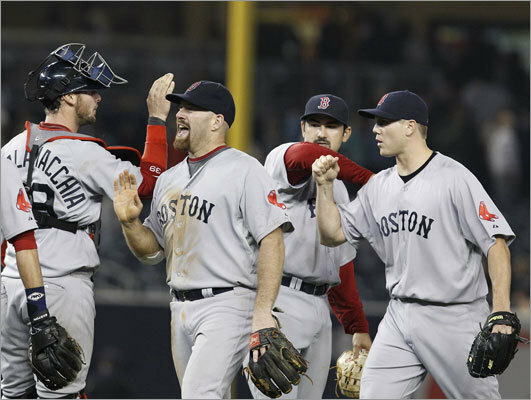 Lester gave up five runs, four earned, on nine hits over four and one-third innings. He walked two, struck out six, and threw 101 pitches. He gave up three runs in the first thanks to an RBI double and a force out, he gave up one in the second on a sac fly (this was the unearned run, because the runner was able to advance from second to third on a passed ball by Salty), and he gave up two in the fifth thanks to a triple and a single. It was one of those games where it was just a chore to pitch. Lester was really laboring, which explains his high pitch count relative to the number of innings he pitched; he threw twenty-nine pitches in the first, twenty in the second, thirteen in the third, nineteen in the fourth, and twenty in the fifth before he was pulled. His cut fastball was good, but his sinker, changeup, and curveball were not great by any means, and he was really struggling, getting behind, and throwing a lot of pitches. Even when he got himself ahead of hitters, there were too many occasions where he couldn’t seal the deal. So the Yanks had the opportunity to see more of his stuff, plus he was getting tired earlier, plus he was putting men on base. When a good pitcher has a bad day, that’s generally what it looks like. We lost, but we’re lucky it wasn’t worse. Slugfests are usually pretty embarrassing, so it’s better to lose with dignity than to lose without it. Atchison replaced Lester after the RBI single in the seventh and pitched the rest of the inning plus the sixth without incident. He made the first out of the seventh pretty quickly before then giving up a double followed by a home run, at which point he was replaced by Melancon, who pitched the rest of the inning plus the eighth. Aceves pitched the ninth. Unfortunately, we didn’t really put up too much of a fight. We scored one run in the first on an error, went down in order in the second, and then scored another run in the third on a double by Papi. We went down in order in the fourth, in four in the fifth, and in order in the sixth. We opened the seventh with back-to-back walks on ten pitches, but we went down in order after that. We scored our last run in the eighth on a double by Aviles. We put two on in the ninth but didn’t do anything with it. But that first-inning run deserves elaboration. Not too much went well yesterday, but I will say that I did thoroughly enjoy Derek Jeter’s day in the field, which absolutely abysmal. In all the Sox-Yanks games I’ve seen, I don’t think I’ve seen a single fielding performance by Jeter as terrible as this one. It was awesome. With runners on first and second in the first and one out, Jeter had plenty of time and space to catch what was supposed to be a routine popup by Ross to end the inning. And he just dropped it. He dropped it. It was amazing. The ball was right there, and he dropped it. I’ve never seen that before. It was the most pathetic thing ever. The crowd went wild, and for good reason. It was definitely one of the highlights of the season. And Ciriaco came right on home. Sweet, sweet, sweet stuff. And he wasn’t even done. He completely botched what was supposed to be a routine ground ball as well as completely ruined a throw to first in the third, which accounted for two of the base runners we had in the third inning. Thus, the final score was 7-3. 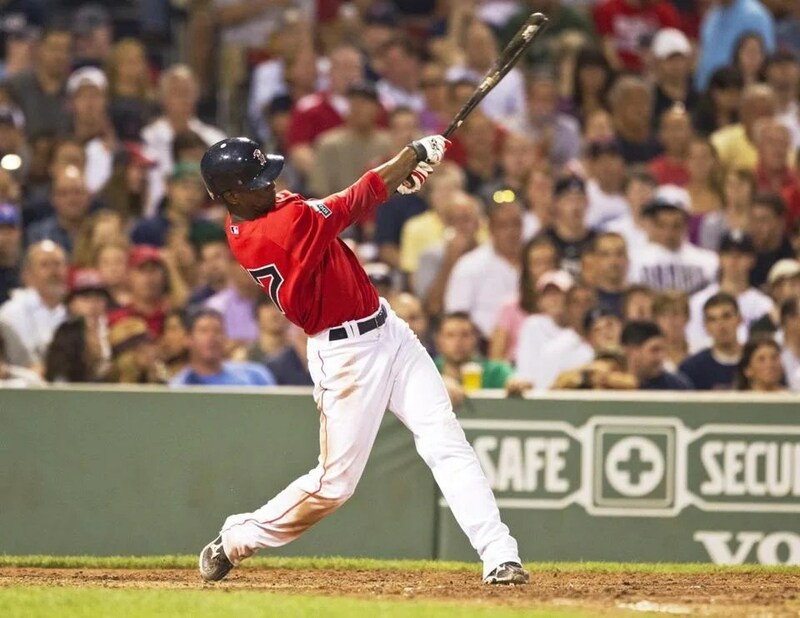 Punto went two for four, and Ciriaco had another great game with a three-for-four performance. Defensive highlights, aside from the Yankees’ blatant examples of lack thereof, included Sweeney’s ridiculously outstsanding catch to end the fifth; the ball was hit to shallow center field, and Sweeney charged and dove front-first to haul it in. We had half as many hits as they did, and those two doubles were our only extra-base hits. We went two for fourteen with runners in scoring position and left twelve on base. Despite the fact that the Yankees had fourteen hits to our seven, they went three for fourteen with runners in scoring position and left eleven on base, so from that perspective the team were evenly matched, and you can see that the Yankees also had plenty of opportunities of which they did not take advantage. But they still won, so that observation doesn’t do much. As for the bigger picture, we just lost three out of four games to the Evil Empire and we enter the All-Star break at .500. We are tied for fourth (or last, again, depending on how you look at it), and we are nine and a half games out of first. For his part, Lester enters the break with the lowest ERA he has ever had in any first half of any season in his career as well as the lowest strikeout total he has ever had in any first half of any season since 2008. However, it is also true that we can expect the returns of Ellsbury and Buchholz to be imminent, and I imagine that Pedroia’s return can’t be too far off, either. No matter what, no team in the Major Leagues needs a break more than we do. We need to regroup, refocus, and just figure out how to win as a team and on a consistent basis. We need to find our groove. And when we find it, we need to stay in it and ride it to a good place. Let’s start with the bad news first. How convenient that it actually occurred first. We lost the opener, 6-1. Morales basically imploded and had one of the worst starts a pitcher can have. He was the starter for the day and gave up six runs on six hits over the course of three and one-third inning. If that had been all and he just had a bad day, it would still have been painful but at least it would have been acceptable. The fact that all six of those runs scored via the long ball is simply unacceptable. That means that way too many of his pitchers were just really bad mistakes. You never want to be on the business end of a clinic-like slugfest performance. Morales gave up two consecutive home runs in the first inning, one three-runner and one solo shot. He somehow sent the Evil Empire down in order in the second and somehow pitched around two baserunners in the third, and then he gave up two straight solo shots to open the fourth. One popout and one baserunner-via-error later (you can thank Gomez for that), he was replaced by Justin Germano, who, despite a bases-loaded situation in the fifth and two baserunners in the eighth, did not allow any runs. Meanwhile, we scored a grand total of one run, and we played small ball to get that one. Papi and Gonzalez hit back-to-back singles with one out in the fourth, and Gomez singled in Papi. That was it. That was all we came up with. We went down in order in the second, third, sixth, and ninth. The sixth was particularly infuriating because technically it didn’t have to be that way. Papi walked to start the inning, and then Gonzalez hit something that looked like it was headed for the Monster for sure. Unfortunately it was caught, but Papi had already rounded second and couldn’t get back to first, so obviously he was out. We had two on in the fifth but did nothing with that opportunity. We had only four chances with runners in scoring position, and Gomez went two for four for our only multi-hit game. I may add that Darnell McDonald, in his first game with the Evil Empire, went hitless and dreadlock-less. It’s always a sad day to see one formerly your own have to go to the dark side. So that’s the bad news. The good news is that we split the day and won the nightcap, 9-5! Revenge is a dish served cold. Well, it’s July in Boston, so I don’t know about cold, but I can tell you that it was sweet. Doubront gave up four runs, three earned, on four hits over six and one-third innings. Like Morales, he gave up multiple home runs. He gave up two: a three-run shot in the fifth and a solo shot to lead off the seventh. So, like Morales, all of his runs were unfortunately scored via the long ball. The unearned run scored as part of that first home run; Derek Jeter opened the inning by getting on base thanks to yet another error by Gomez. But unlike Morales, he eventually buckled down; those home runs bookended an actually decent performance. After that second home run and then a groundout, Albers replaced Doubront and pitched the rest of the inning. Mortensen came on to pitch the eighth and loaded the bases with one out; he was then replaced by Padilla, who thankfully ended the inning. And then Aceves pitched the ninth and gave up a solo shot in the process, but for the first time in at least several games, it didn’t matter because we won anyway! We began the game quietly by going down in order in the first and in four in the second. We got on the board in the third, when Gomez doubled, Pedro Ciriaco singled, and Nava grounded into a double play that brought in Gomez. A very modest play, if you ask me. We went down in four in the fourth again and then played some more small ball in the fifth; Gomez popped out, Ciriaco singled, Nava reached on an error by McDonald, and then Punto hit a sac fly that brought in Ciriaco. We continued in the sixth; Gonzalez singled, Ross reached on an error by Jeter, Sweeney popped out, Gomez singled, and Ciriaco smacked a bases-clearing double that gave us the cushion we were looking for. Run-wise, our big inning was the seventh. Gonzalez began it with a double. Then Ross lined out, and Sweeney tripled Gonzalez in, and Gomez doubled Sweeney in. Aviles came in to pinch-run for Gomez and scored on a double by Ciriaco. And then Ciriaco stole third and scored on an error. So between the sixth and seventh, we sent the full lineup to the plate twice, once per inning, and scored seven runs. And that was the game right there. We posted seventeen hits to their six, and we made two errors to their four. (Obviously we shouldn’t have made any, but it is what it is.) Papi went two for four, Punto went two for three, Gonzalez went three for five, and Gomez went three for four, but the man of the hour was unquestionably Ciriaco, who went four for five with two doubles, two runs, four RBIs, and a stolen base. I’m telling you, it’s been a long time since we turned to a Pedro to lift us up and since we changed that name when he did, but it feels pretty good. The win snapped our losing streak at five, it was our first win over the Yanks this year, and it puts us one game back up over .500. Did I mention that we beat the Yanks? This can not be overstated: it felt good. It felt really good. First of all, let me just say that honoring Papi before the game for his four hundred career home runs was a very nice and well-deserved touch. When I emphasized our need for a strong series, a game like last night’s was not exactly what I had in mind because we lost. We are now eight and a half games out of first place, a new season high, or more accurately a new season low. To be fair, it wasn’t one of those games where the Yanks just scored a mountain of runs and then we had to battle all the way back from scratch but failed to score those few extra we needed at the end. Our hitters did not procrastinate. We stayed right with them, neck-and-neck throughout the contest. That was why the outcome was crushing. Beckett did not have a good night by any stretch of the imagination, and it’s always funny how a bad night against any other team looks so much worse against the Evil Empire. He only lasted five innings and gave up six runs on eight hits while walking two and striking out five. He threw ninety pitches, forty-nine of which were strikes, so just over half or so. It was not pretty. He faced the entire starting nine in the first inning alone, and this is how it went: two straight singles, a hit batsman to load the bases, a five-pitch walk to walk in a run, an RBI single that scored two, a sac fly that scored one, another single, and another sac fly to score another one, and finally a groundout to end it. It was painful, it was humiliating, it was horrific, and if it wasn’t a sign for things to come, I don’t know what was. Fortunately, at least at the time, we actually succeeded in getting all of those runs back and tying the game at five before the first inning was even done. It was amazing, and it gave us a reason to believe that we were still in this thing, because for most of the game we actually were. Nava led off the first for us with a double, advanced to third on wild pitch, and scored on a sac fly by Kalish. Then Papi singled, Ross reached on an error, Gonzalez doubled in Papi, and Salty hit a huge three-run shot on his second pitch that ended up in right several feet away from the foul pole. I mean, that’s basically what happens if you throw a middle-in fastball to Salty. It was his seventeenth of the year, a new career high. We continued playing cat-and-mouse for pretty much the rest of the game, right up until the Yanks scored their two winning runs that we obviously did not answer. Beckett gave up a triple followed by a groundout for another run in the top of the second; Nava got hit, Kalish singled, and Nava scored on a single by Papi in the bottom of the second. Both teams went down in order in the third. Neither team scored in the fourth, either. The Yanks didn’t score in the top of the fifth, and we gave ourselves our first lead of the night in the bottom of the frame; Gonzalez singled, moved to second on a wild pitch, and scored on a single by Gomez, which made the score 7-6. Neither team scored in the sixth, which Albers pitched. But it turned bad again in the seventh, when Miller came on. He gave up a walk and a single followed by a strikeout. Then Padilla came on and gave up a triple that scored two. He followed that with a strikeout and then a double that scored one. Atchison came on and then allowed his inherited runner to score on a single. And the squandering of the one-run lead continues. Ross homered to lead off the seventh on his third pitch, which ended up in the Monster seats. Salty’s home run scored more runs, but Ross’s home run was a moon shot. The ball went over the Monster. Not in it. Over it. And it’s hard to hit a homer more moon shot-esque than that. We put two men on over the course of the rest of the inning, but it didn’t amount to anything because Derek Jeter just had to convert what would have been a surefire hit into a force out, and then Punto struck out to end it. Melancon pitched a solid eighth and ninth, during which we did not score. And then we went down in order in the bottom of the ninth, and the Evil Empire won, 10-8. Gomez went two for four, Gonzalez went three for five, and Papi went three for four. Both teams posted fourteen hits each and converted four of their opportunities with runners in scoring position. Beckett received a no-decision, Albers received a hold, Miller received both a hold and the loss, and Padilla received a blown save. Defensive highlights included Punto gunning down A-Rod at home in the fifth for the second out. It was an absolutely perfect block and tag. What a textbook play. The reason why this loss was so rough was not only because we lost to the Yankees, which is obviously a really big part of it. It was also because we were right in that game until, well, until we weren’t anymore, until they scored those two runs that would go unanswered. To have to witness the Yanks get five runs off of Beckett and then to watch as we got every single one of those runs back, three of them on one swing of the bat, before the first inning was even over was just truly awesome and amazing. And then to watch us stay right there with them almost every step of the way, like I said, was a real testament to what we have in us and how great we can really be. And, like I said, that was why the loss was so devastating. It was because we could have won just as easily as we lost. As I walk away from this game, I can look at the man in the mirror and be proud I gave everything I could to this game, this organization, my teammates. Once again, I just want to say thank you. But he won’t be leaving the game completely; he’ll be taking up a position within the organization, which I think is an excellent move. To be a good catcher, one must inherently possess the ability to maintain a working knowledge of all aspects of the game, not just his own position. This plus the fact that he was a captain for seven of the fifteen seasons he played here make him an obvious choice for hire. What’s funny is that a fan took a video during a clubhouse tour on Truck Day and saw that Tek’s nameplate had already been taken down. Lucchino’s explanation for this was weak, and so the fan already knew what would happen. What I liked best about this story is that the fan specifically didn’t post the video until after Tek made his decision. Bobby V. has banned alcohol in the clubhouse and on charter flights returning to Boston. Tito then claimed that this was a PR move, which it isn’t since Bobby V. is known for having similarly banned beer in his previous managerial stints. First of all, it’s very unlike Tito to get involved in drama. Secondly, why are we still talking about this? Last season is last season; it’s done and over. Can’t we just move on already? Maybe that’s what Bobby V. was trying to do when he put down Derek Jeter and praised Tek for the A-Rod fight this week. It certainly did draw attention. Obviously I agree with what he said; it’s just a little unusual to hear it coming from a manager. There’s a reason why there are fans and managers and why fans are usually not managers and managers are usually not fans. I’ll be the first to admit that I’m one of the biggest Yankee-haters out there, but I still want a manager who focuses less on the TV cameras and more on the baseball. In the interest of not discussing drama anymore, let’s move to the Spring Training schedule, which officially started yesterday when we played Northeastern and Boston College in a doubleheader. Today, the Major League action begins with the start of a two-game series against the Twins. We’ve got the O’s on Tuesday, the Jays on Wednesday, and the Cards on Thursday. Then the Pirates and Rays, and we’re done for the week. Here are some highlights from the results. We swept the college doubleheader as well as the two games against the Twins with scores of 8-3 and 10-2. Lester pitched two shutout innings against Northeastern. Beckett pitched two scoreless innings; he walked two, struck out none, and was caught by Salty, yet another indicator of the end of an era. In the 10-2 win, Buccholz pitched two scoreless innings; he walked two and hit one but struck out two and extricated himself from two sticky situations. Of his thirty-six pitches, twenty were strikes. He looks healthy and says he feels healthy. Ryan Sweeney picked up and RBI, and Papi hit his first homer of Spring Training, a solo shot. Major League Baseball and the Player’s Association have agreed to expand the playoffs, effective this season. Each league will not send not one but two Wild Card teams to the playoffs; the two teams will have to go at it in a single elimination game. This is the first playoff expansion since 1994, and it creates the largest playoffs in the history of the Majors. It’ll certainly boost ratings and nail-biting, that’s for sure. It presents a double-edged sword. If this system had been in place earlier, we would have made the playoffs in the last two years. On the other hand, I don’t want to make the playoffs because the bar is continually set lower by a policy of increased inclusivity, and there’s always the chance that that other team is going to beat you before you get anywhere. In other news, the B’s lost to the Sens, Isles, and Rangers but beat the Devils and signed Marty Turco. This is fun. I like this. I like how playing in Yankee Stadium is no big deal anymore. Actually, with the way we’ve been performing there recently, it feels kind of like Fenway. I mean, except for the fact that Fenway is so much better in every conceivable way, of course. I just mean we’re ruling it as if it were Fenway. We have now swept the Evil Empire on their home turf in less than a month’s time. In this series, we scored twenty-five runs to their ten. Yankee fans must be in a world of hurt right now. Cool. Beckett totally dominated. Seven full innings, two runs on four hits, two walks, six strikeouts. 104 pitches, sixty-five for strikes. Lethal cutter. Lethal two-seam. Excellent curveball. The rest of his pitches on the whole weren’t at the level of those three, but they were still effective. 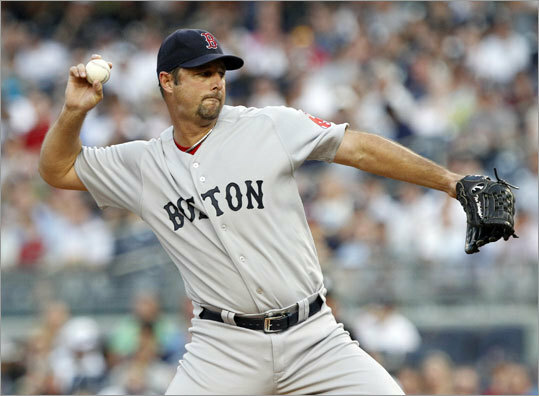 Beckett didn’t record his first strikeout until the third inning, when he rang up Mark Teixeira with a curveball. He would record a second strikeout with his curveball later on. Two other strikeouts were ultimately achieved using the changeup, and one each with the four-seam and the cutter. The two runs he allowed came in the first; he drilled Derek Jeter, and then Curtis Granderson went yard. But Beckett went on lockdown after that, and that was it. It was his fifth win of the season, three of which have come opposite CC Sabathia. May I say that I derived an immense amount of pleasure from observing the complete and total meltdown of the Sabathia’s entire baseball universe in the seventh inning. Right through the seventh, the game was every bit a pitcher’s duel that the Yankees were in the process of winning by two runs, and we had yet to score. Our best opportunity came in the second with two men on base. The seventh inning erased all those zeroes that came before it. In the seventh inning alone, we scored seven runs. Papi singled to lead it off and scored on a triple by Lowrie. Crawford grounded out for the first out of the frame. Then Cameron promptly doubled to bring Lowrie home. Tek singled, and Ellsbury singled to bring in Cameron. Scutaro lined out for the second out of the frame. Then Gonzalez singled and brought Tek home. Then Sabathia left, and David Robertson came in. 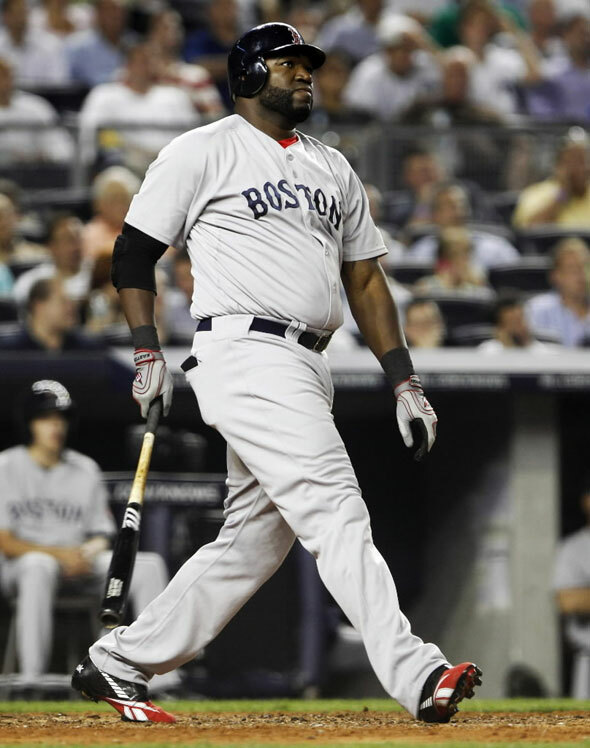 Ellsbury scored on a single by Youk, and Gonzalez and Youk scored on a double by Papi. Eight of our twelve total hits were made in that inning alone. Scutaro doubled and scored on a double by Gonzalez in the top of the ninth; the Yanks got that run back in the bottom of the inning. But we won, 8-3. No home runs. Nothing too flashy. Just hit after hit after hit in an incredibly huge inning. That one bad inning is pretty bitter medicine, isn’t it. We are the first team this year to beat the Yanks in six consecutive games, something we haven’t done on the road since 1912. And we did it even with a rain delay of three hours and twenty-seven minutes. In other words, by the time the game could have been over already, which is a fair statement to make considering the fact that the game itself lasted three hours and eleven minutes, we were just getting started. But it was worth the wait. I’ll be taking a break for about two weeks; we’re two games in first, and I expect that, within that time, our first-place lead will widen considerably. If we keep playing like we played during this series, that’s as good as guaranteed. In other news, from a Bruins perspective, no other time to take a break could possibly be worse. Last night wasn’t Wake’s finest hour. Collectively, though, it was a pretty fine hour for the team as a whole. Ladies and gentlemen, say hello to the one and only possessor of first place in the AL East division. We beat the Yankees again, so the worst we can do now is win the series. The best we can do, of course, is sweep. But I’m getting ahead of myself. Last night had plenty to recap. As I said, Wake wasn’t feeling it. He gave up five runs on five hits while walking three and striking out three. He threw ninety-one pitches, fifty-six for strikes. He made his exit in the sixth, leaving behind one out and two on. Aceves came on and loaded the bases. Then he allowed an inherited runner to score. At that point we had a three-run lead that was looking pretty shaky. It took him six pitches, but Aceves finally got Derek Jeter to ground into a double play to end the inning. Crisis averted. He later gave up a run of his own in the bottom of the ninth. Wake picked up the win, and Aceves picked up a three-and-two-thirds-inning save. The final score was 11-6. We are seven and one against the Yanks this year, we’ve won all of our last six contests against them, and we’ve won five of those six on enemy soil. Not bad for a team that started out in last place. And those two, Wake and Aceves, are model team players, given the way they’ve pitched in when Lackey and Dice-K were on the DL. So the whole game was just a great one to watch. The game started out innocently enough. Ellsbury singled and scored when Gonzalez grounded out. Youk walked after that. And that’s right around the time when you start thinking about how totally awesome it would be if Papi hit a home run. So that’s what he did. He launched a two-run shot into right center field. Papi had been fed a steady diet of pitches away to that point. But then he got a great one right down the middle. Why pitchers think they can throw fastballs down the middle right by us is beyond me. He didn’t flip his bat this time, but trust me, he was thinking it, and he was thinking it loudly. The game only got better from there. Scutaro singled to open the second inning, stole second base, moved to third on a throwing error, and scored on a sac fly by Drew. After AJ Burnett loaded the bases with an intentional walk in the fourth, Tek hit into the force out as planned, but a run still scored. Ellsbury doubled in another after that, and Pedroia singled in another. His hit just barely cleared Jeter’s glove. Wake gave up a homer to A-Rod in the fourth, and they added three more runs in the fifth. We got one of them back in the sixth; three walks were issued in the bottom of the sixth alone, and one of them scored a run. Seriously, there are few things more humiliating than a pitcher walking in a run. The Yankees added another run in the sixth. And then nobody scored anymore until the ninth. Going into the inning, the Yankees were down by only three, and that just didn’t seem like enough to hold them. I think Crawford and Drew heard it too because they both hit home runs in that frame. Crawford went first with a solo blast on a changeup down and in. Scutaro doubled after that, so it was even better when who but JD Drew smashed a towering plast into the bullpen. It was a good thing, too; Aceves would allow his run in the bottom of the inning, which would trim our lead. But only by one. We still won by five. We’re still on the verge of increasing our first-place lead to two games. And we scored eleven runs against the Yankees. Life is most excellent. In other news, the Stanley Cup finals is now even at two apiece. The Bruins shutout the Canucks last night, four-zip. Tim Thomas made thirty-eight saves en route. Last night’s game could not have been a more quintessential example of Sox-Yanks. It was long (all told, the whole game lasted three hours and forty-one minutes and spanned two days), it was suspenseful (both pitchers were struggling so the teams were going back and forth), it was powerful (five home runs were hit between the two teams), and it was close (the final score was 7-5). And it had a winner and a loser. The Yankees lost. (I can only imagine John Sterling having to announce that on the air.) We won. We swept the Yankees, and for the first time this season, we are now at .500! Forty games in, we are twenty and twenty. Finally! The key of course will be staying at .500 and getting significantly above .500, but one step at a time. It turns out that all this realigning of the rotation was done specifically to ensure that our top three starters would take on New York. But that wasn’t why we won last night. It may have been Lester up against Freddy Garcia, but he sure didn’t pitch like it. Lester struggled early. He hit Derek Jeter, who scored on a single by Mark Teixeira in the first. He allowed two home runs in the second for a total of three runs. Clearly his cut fastball wasn’t cutting or doing much of anything. When he threw only nine pitches in the third, his only one-two-three inning of the night, I thought it would be smooth sailing from there, but his turnaround wasn’t quite that complete. He didn’t allow any more runs, but he did walk four over the course of his six innings. He allowed those four runs on five hits and struck out seven. Not his best night, but not his worst either. If those two cut fastballs actually cut or did something, he would only have allowed one run. Still, overall, his pitches weren’t quite as effective as they usually are. In the sixth, he threw twenty-two pitches, only nine of which were strikes. He’s won five consecutive decisions, but in his last two starts, he’s walked nine. Aceves came on to pitch the seventh and allowed New York’s fifth run; Curtis Granderson walked and scored on a double by A-Rod that should have been caught by Crawford, who instead made his first error in a Boston uniform. Bard came in after that for the eighth, Paps took care of the ninth for his second save in three days, and finally the game was over. Our lineup kept pace through the first three innings. The Yankees scored first in the first; we got that run back in the second. Youk struck out but reached on a passed ball. A single and a walk later, the bases were loaded for Lowrie; all he could manage was a sac fly to bring home Youk and tied the game at one. Papi tried to put us ahead; Crawford reached on a fielder’s choice, and Papi tried to come home but was out at the plate. The Yankees put up a three-spot in the second with home runs; we put up a three-spot in the third, and we needed only one homer. Ellsbury led off the inning with a double. Two batters later, Gonzalez walked on five pitches. And then, with the count full, Youk blasted one into the seats in left. I mean, come on. It was a fastball right down the middle. It was eighty-nine miles-per-hour, which is obviously slow for a fastball, but it was right down the middle, and I don’t think anybody should have been surprised at what happened to it. We put ourselves ahead by one in the fifth. With two out, Papi broke his bat hitting a solo shot to right field. (I also appreciated his dance performance during Tito’s in-game interview.) But the way the game had been going, we knew a one-run lead wouldn’t be good enough. In the seventh, Pedroia walked, stole second base, and scored when Youk seemingly grounded to third. But the ball rolled – wait for it – between A-Rod’s legs and Pedroia came home. I couldn’t help but laugh out loud at that. Oh, how the tables are turned. Then the Yankees got that one back in the bottom of the seventh, so we were back to a one-run lead. Joba Chamberlain came on to pitch the eighth and got Crawford to ground out on his first pitch. He had two strikes on Salty before throwing two balls. With the count even at two, Chamberlain threw a slider that didn’t slide. Salty was all over it. He hit his first home run since August 2, 2009 and the first this year for our catchers. He sent it to the first few rows of seats in right. It was barely out. In fact, it hit the top of the wall. But it was still awesome. And that was it for scoring last night. To recap, we swept the Yankees. In New York. To get to .500. We’ve won five of six games against the Yankees this year. During this three-game set, their number three, four, and five hitters went six for thirty-four. In 1996, it took us 128 games to get to .500; in 2011, it’s taken us 40. This past weekend was one of the best weekends in our entire 2011 baseball lives. But we’ve still got work to do. Onward and upward. We start a seven-game homestand today when we take on the Orioles. This is a perfect opportunity to actually do something with the momentum we’ve created. We’re at .500. We need to pass that. We need to keep on winning. It’s Dice-K today, but as a team, we should be able to do something with the Orioles.